Apple could spend over $500 million on its soon to be released gaming subscription service Apple Arcade, according to a report by the Financial Times. The service, which was announced at the Apple event in March, is launching sometime between September and November this year. A firm release date is still to be confirmed. Apple Arcade is a mobile and Mac gaming subscription service that promises to bring the best games on the App Store to subscribers for free. 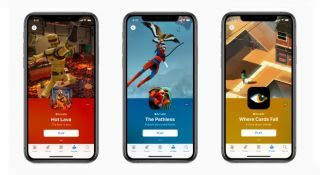 Alongside its launch, Apple announced that it would be home to 100 exclusive titles including Beneath a Steel Sky, a Sonic the Hedgehog game, and games from Cartoon Network, Giant Squid, Snowman, ustwo games, Konami, Lego, and many more. These exclusive games could prove expensive for Apple; according to CNet, "sources informed the Financial Times that many of the games in the works have budgets in the millions". Apple's gaming subscription service will be available on iPad, iPhone, Mac, and Apple TV, and according to the company won't feature any ads, ad-tracking, or additional purchases. So far, Apple hasn't announced how much Apple Arcade will cost, but its $500 million investment could well push up prices for the consumer.